Forget Microsoft, News Corp. or even Apple. Nokia, the world’s no.1 mobile handset maker, should buy Yahoo. Or so says Information Week’s Stephen Wellman. Wellman puts forward a compelling argument: If Nokia is repositioning itself as a Web services company, to combat falling profit margins on its hardware, then acquiring Yahoo would help to give the company a much needed presence on the desktop (not just mobile), as well as beef up its Web offerings and Internet brand recognition in general. 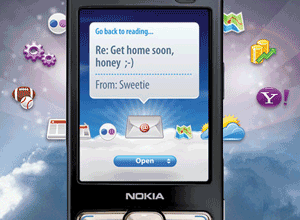 “Nokia is now a Web company, not just a handset maker. But, the company acts as if the Web is just mobile and has no desktop component. This isn’t a very smart strategy”, writes Wellman. All of Nokia’s mobile web rivals: Google, Microsoft and, of course, Yahoo all have desktop products. “These Web giants are leveraging their vast desktop Web audiences to grow their mobile initiatives. While Nokia has tons of mobile phone customers, it doesn’t have as many Web application users”, notes Wellman. As well as gaining a presence on the desktop, a Yahoo acquisition would help Nokia to further develop its range of location-based services (building on its purchase of GPS company Navteq), again to fend off challenges from Google. Ditto mobile advertising. In addition, Yahoo would give Nokia an instant bump in its U.S. brand recognition. Despite claiming a 40% worldwide market share for mobile phones, Nokia doesn’t compete nearly as well in North America. Overall, however, a combined Yahoo/Nokia (Yokia!) would provide Google with a formidable competitor in the pending battle for the mobile web. This is, as ex-Microsoftee Robert Scoble likes to point out, the real reason why Microsoft is attempting an aggressive takeover of Yahoo. What do you think? Should Nokia merge with Yahoo? And yes, before you ask, Nokia does have the cash.